Donald Trump Jr. appeared on Fox News' "Tucker Carlson Tonight" on Monday to discuss Special Counsel Robert Mueller's report. Carlson and Trump Jr. talked about none other than House Intelligence Committee Chairman Adam Schiff (D-CA) who has continually insisted that President Trump indeed collude with Russia, even after Attorney General William Barr's summary vindicated the president. "You've got the leader of the tinfoil hat brigade, Adam Schiff, out there every day talking about the 'evidence of collusion' that he's seen," Trump Jr. explained. "He's flagrantly lying to the American people. He's doing it every day on national television." According to Trump Jr., Schiff gets away with what he says because the media continually covers for him. 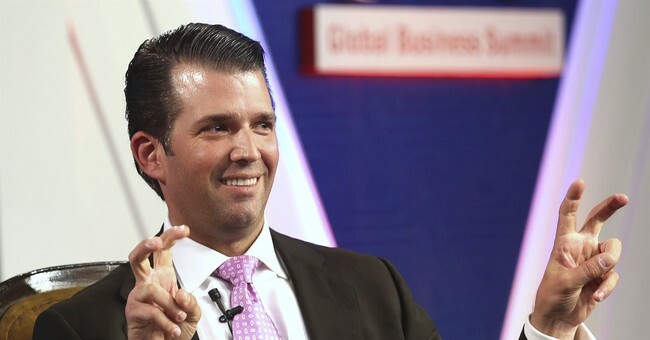 "He's gotten more air time than, amazingly enough, Michael Avenatti, but they're about of the same level of credibility," Trump Jr. said. "And there's no accountability for it, Tucker, because when you're on that side and you have the media carrying your water for you, you can say whatever you want." Trump Jr. is right. Schiff, and other Democrats like Jerry Nadler, get away with continually pushing the idea that collusion existed. Part of it is because they're Chairmen of important committees, Schiff as the head of the House Intelligence Committee and Nadler as head of the House Judiciary Committee. People take what they say seriously. The media automatically assumes what they're saying is factual because they come from a place of authority. Apparently the mainstream media didn't learn their lesson when they ran with the idea the "Collusion! Collusion!" point of view. It's for this very reason that House Minority Leader Kevin McCarthy (R-CA) called on Schiff to resign from the House Intelligence Committee. Whether or not he actually will is a totally different story.